Whether in rolling fields, a greenhouse, or small growing chambers, plants are steeped in biochemistry that is ripe for study. 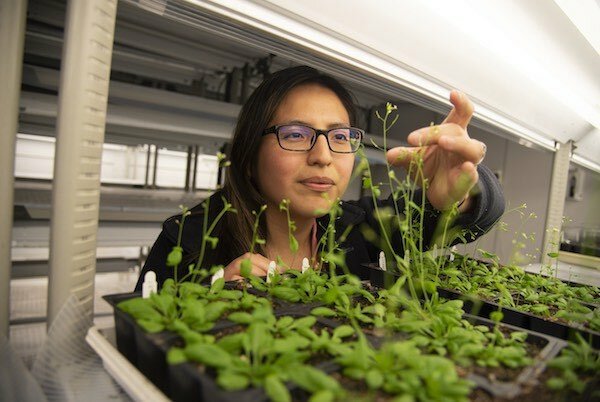 Studies of plants in the University of Wisconsin–Madison Department of Biochemistry span everything from how they can be grown or consumed for agricultural or bioenergy purposes to a basic understanding of cell biology in plants and animals. Professors Richard Amasino, Sebastian Bednarek, John Ralph, Ivan Rayment, and Mike Sussman — and students in their labs — all take advantage of the unique properties of plants to investigate how plants work and can be better utilized, but also what that understanding can mean in other contexts. Amasino is a plant biochemist in the department who uses biochemical techniques and genetics to unravel what regulates plant growth and development, with a particular focus on the act of flowering. He studies how the environmental conditions that plants experience affect them on the molecular and genetic level to bring about flowering. His work in recent years has focused on vernalization, a process in which flowering in plants is blocked until it has gone through a sufficient cold spell. Examples of this include flowers like lilies and vegetables like beets, cabbage, or carrots. The plants he studies include the grass Brachypodium and the member of the cabbage family Arabidopsis. Amasino and his team are working to reveal what genes are involved in this process and how they keep grasses from entering their flowering cycle until the season is right. For example, they recently uncovered a gene they called RVR1, for its role in repressing another gene called VRN1 that helps initiate vernalization. Plant breeders are interested in genetic findings like this because it allows them to explore ways to develop crops that are more efficient and have higher yields of food or energy. Kevin Mayer (back left) of the Amasino Lab observes plants in a growth chamber with undergraduate John Barth (right). Also investigating ways to get more energy and value out of plants is Professor John Ralph. Plants are sturdy in part because of the polymer called lignin that binds plant fibers together and makes stems hard and durable. These characteristics are great for the plants — they’ve allowed them to endure for millions of years — but not ideal for releasing the energy stored in the plants for uses like bioenergy. Ralph is an authority on the biochemistry of lignin, especially when it comes to synthesizing it and breaking it down. His group studies what’s responsible on the genetic level for synthesizing lignin and how those genes can be altered to create lignin that’s easier to break down or to provide additional value. Over the years Ralph and his team at the Great Lakes Bioenergy Research Center, housed in the Wisconsin Energy Institute, have made lots of progress. They have been involved in the discovery of new genes involved in lignin production. Most recently, they’ve worked with collaborators in discovering new “monomers” from which the polymer is made, some of which can be used to make lignins that are more uniform rather than complex. The group has also discovered that there might be a way to incorporate valuable commodities and substances like pharmaceutical compounds into lignin, making them available by the ton in what is currently waste material. With the help of collaborators, he’s taken his idea of changing lignin to make it chemically break down easier through a sophisticated research pipeline. They demonstrated the workability of a model system, found the gene required, and eventually genetically engineering poplar trees to produce “zip lignin” that others in the bioenergy field are now utilizing to produce liquid fuels and paper more efficiently. The lab of biochemistry professor Ivan Rayment uses structural biology to discern how proteins function. While much of the lab’s work focuses on motor proteins in muscle — in fact he was the one to first solve the structure of myosin, muscle’s most important motor protein — one graduate student’s project is taking on Fusarium head blight, a fungal infection that can affect crops. Karl Wetterhorn has been continuing a line of work in the Rayment Lab investigating a way to inactivate a toxin the fungal head blight releases onto plants once it lands on them. Started by a graduate student over a decade ago and then passed to a second and finally Wetterhorn, the research has successfully enhanced a naturally occurring enzyme from rice to potentially prevent the fungus from spreading on cereal crops like wheat. The fungus is devastating — and can result in more than $1 billion of lost profits on a bad year — because after finding its way onto a wheat head, it produces a mycotoxin that prevents the plant from defending itself. Wherever the toxin gets, the plant can’t synthesize any enzymes to protect itself. A previous student had found an enzyme that reduced the damage from the toxins dramatically but the structure and the chemical mechanism were still unknown. head blight from the Rayment Lab. The enzyme adds a glucose molecule — a type of sugar — to a specific part of the toxin. The big molecule probably prevents the toxin from binding to the plant’s protein-producing machinery, which would cause it to stop working. He says the next step is plant breeders engineering wheat to express this enzyme to test if it helps them combat the fungus. The next challenge Wetterhorn is facing is that even though their new enzyme can likely stop the fungus from spreading, any presence of the fungus can still be toxic to animals and humans. They are looking to break a particular bond in the toxin to inactivate it for good. They are both looking for a naturally-occurring enzyme and trying to engineer one that can help with this problem. What Can Plants Tell Us About Animals? Studying plants doesn’t just shed light on how plants work. It can also shed light on how animal cells — including those in humans — work. The laboratory of Professor Sebastian Bednarek uses Arabidopsis thaliana, a plant related to cabbage and mustard, to study cell biology broadly. His research explores how plant cells divide to create new cells and how cellular processes in plants are related to those in animal cells. Both plants and animals get bigger by dividing their cells to make more cells, and the process involves the use of some common evolutionarily conserved proteins. However, unlike animal cells, construction of the new membrane and cell wall that separate the dividing daughter cells is an inside out process. Rather than the cell wall coming together from the outside and pinching off to form two cells, plant cells must build a new structure from the inside out to divide two cells that are fixed in place. This cell structure — called the cell plate in plants — is a complex yet organized amalgam of proteins, lipids, and cell wall polysaccharides that is the gatekeeper of what gets in and what gets out of the cell. Because of this, creating a cell plate in dividing plant cells, which will become the membrane and cell wall between the new daughter cells, is no small feat. The individual components of the cell plate are largely made inside and shuttled to the division region to assemble it. This is the process that Bednarek studies closely. a high school intern how to work with seedlings. manipulates a plant in the lab. For Bednarek, using Arabidopsis as a model organism isn’t just to be able to provide insight about how other plants work, but also animals like humans. His lab is highly interested in protein trafficking — how the mind-boggling array of proteins in the cell are taken where they are needed after being created and finally taken to be broken down or recycled afterward. For example, graduate students Jessica Cardenas (pictured at top) and Dana Dahhan investigate a protein called CDC48 that is essential for the formation of the cell plate, along with many other functions. They say the ring-shaped protein is analogous to a socket wrench handle. Different proteins, or different sized “sockets,” attach to it and help it bind to many other protein complexes. Inactivating or losing this protein causes plant growth to arrest at the embryo or seedling stage, the researchers say. One of the “socket” proteins that CDC48 works with is called PUX1. When it binds to the wrench handle, it breaks it apart so it can no longer carry out its many functions. This means PUX1 is what’s called a disassembly factor. a protein similar to CDC48 in humans has roles in diabetes and cancer and that is something the Bednarek Lab and others can explore as well.